I almost forgot; I had been to Shanghai before. It was the Chinese New Year of 1990, I decided spontaneously to go to a friend’s home to spend the holidays. On New Year’s Eve, I boarded an airplane in Guangzhou, and landed, several hours later, at Hongqiao Airport in Shanghai. From the airport, I took a taxi to the Shanghai Train Station. I remember it was dusk, the sky overcast, the air chilling beyond a northerner’s assumption of Shanghai. There was not a soul on the streets. I don’t know why, but right at this moment, I am thinking about six o’clock. Two clicks away now, I know the trip is sixteen kilometers long, and passes a zoo, at least one movie theater, the Sun Yat-sen Park that every major Chinese city has, and streets that once had names like Jernigan Road and Edinburgh Road. But I was either dozing off or lost in wandering thoughts in the taxi, for all I can recall of Shanghai are a section of a gray wall and a few buildings whose shapes are as illusory as objects in a dream. At the train station, I boarded the train, according to my friend’s instructions, to go to my destination, Hefei. My friend lived on a university campus where all the students were gone for the holidays and, blanked under a new snow, silence reigned. After the lunar New Year’s Day, I walked on the streets of Hefei. Even though I had never been to that city before, or anywhere near it for that matter, everything seemed familiar to me, the streets, the buildings, the shops, and the people; the wintry bareness and the muddy slush underfoot. It was just like my hometown, or thousands of other Chinese towns. It was China. To my ears, the first winter after the summer of ’89 was as silent as death, the roar of bulldozers and dump trucks were yet to arrive, and I was preparing to leave the country. I had always known the path I could take would be narrow, but I didn’t know I would be up against the wall in only a few short years after college. About the place I was planning to go I had not the faintest idea and, therefore, no fantasy of it to speak of; the only thing I knew for certain was I had to go, anywhere I could. The year after, I left China and came to the United States. In the following days, I talked to Mr. Sheng via telephone and email. I learned that, when his brother was arrested the second time in the north, he was a student of astronomy in Nanjing University with a focus on celestial mechanics. I asked how he would describe celestial mechanics to a layman like me, he said, “It is the mathematics dealing with the motion of the three bodies—the Sun, the Earth and the Moon.” I said I still couldn’t imagine what mathematics that would be, but I liked the words the sun, the earth and the moon. He said, the broader question was the “n-body problem,” or, to predict the motion of celestial objects under mutual gravitation. It was a problem unsolved for the past three hundred years, said Mr. Sheng, and probably wouldn’t be in another three hundred years, but I was determined to do just that! He chuckled in self-mockery, but I was very much affected by the young mathematician’s ardor. Mr. Sheng escaped the cataclysm that had befallen millions of China’s educated class, university students included, during the Anti-rightist Campaign in 1957, but it stoked fear in him as he came to the realization that everything about him, his family background, his disgraced brother and his own education, could be a liability. He said he woke up every morning not knowing what the day would bring and went to bed every night worrying about what awaited him tomorrow. He was one of the top students but not selected to join the faculty of Nanjing University, nor for graduate study. He was assigned to a teaching job at Anhui University in Hefei and has stayed ever since. I told Mr. Sheng about my trip in early 1990 that took me to Shanghai and Hefei, two places I have come to associate with through writing this story. I learned from Mr. Sheng, not without a small sense of wonder, that the Shengs’ in Shanghai was only a short walk from the train station except that, at that time, their home at No. 426 Lane, N. Jiangxi Road, had long been empty. At the Mathematics Department of Anhui University, Mr. Sheng found a certain solace and security in pure mathematics. After the ten-year Cultural Revolution, in the early 1980s, he passed the selection exams for faculty studying abroad. He studied and researched in the Université de Strasbourg in France and the Universitat de Barcelona in Spain for three years. I asked Mr. Sheng when he had learned French, and he told me he started in his boyhood when attending the affiliated secondary school of the Université l’Aurore, a French Jesuit institution in Shanghai before the communist liberation, and later in the famed Li Da Institute. In college and later on, he read mathematical literature in French that he could get a hold of. 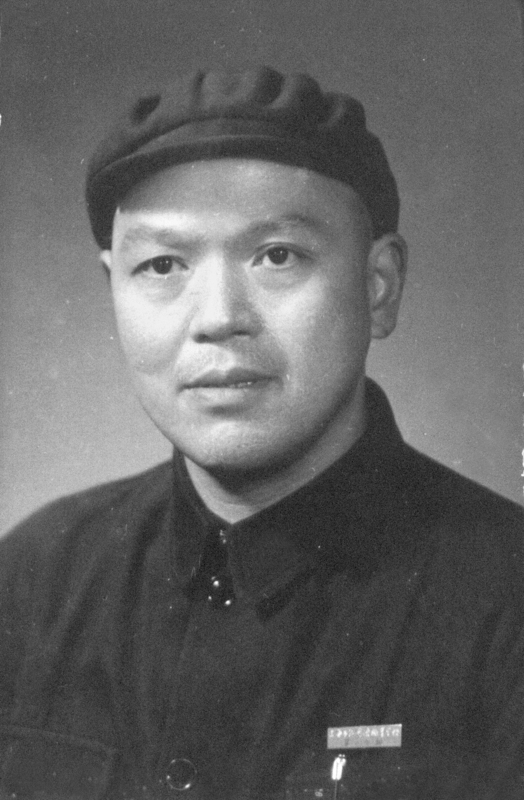 For the first seven years of the 1970s, when he and some of his colleagues, including his department chair, were sent away to the countryside on the bank of Yangtzi River, he worked in the fields, coached a basketball team on loan to the county’s Sport Committee, and took part in the Peasants’ Propaganda Team. And he also kept up with his mathematics. For entertainment, he tried his hand at translating French literary classics that he had bought from the Foreign Language Book Store in Shanghai published by the Russians for language learning purposes. Carmen, Colomba and Ninety-three were some of the titles he ventured into. With The Lady of the Camellias, he did the novel as well as the play. He enjoyed it a lot, sharing his translations with his old school mates in secret. When I asked about his life in retirement, he said reading, writing and playing basketball. Since retirement, he has published a dozen or so papers and written two books, one was Mathematics in the Social Disciplines that had been printed twice and sold out twice; the other is Geometry of Election that he hopes would be published soon. I said jokingly, from the titles of your books, it seemed that you had turned from the celestial to the earthly. When Sheng Shuren returned to the Xinhua News Agency in 1956, he went alone. He was thirty-six years old, father of four, the youngest a newborn. His wife, a head nurse at a children’s hospital, had not wanted to move to Beijing the first time and, with the two years in Beijing ending the way they did, she wouldn’t go this time. At Xinhua, Sheng Shuren resumed his old job of translating foreign media. There is no way to retrieve the products of his work except for three articles in his name in Journalistic Practices, a monthly published by the Xinhua News Agency, in 1957. Two of them are translations, one is his own writing. Both translations are from Russian, one describing “the Central Home for Journalists” in Moscow, how it was “a place for all journalists to engage in creative activities.” Another relates how, during what it calls “the Hungarian Incident” broken out on October 23, 1956, “political adventurists” (they become “gangsters” and then “an anti-revolutionary group” as the article progresses) occupied media apparatuses and controlled newspapers and journals, and how, after the invasion of the Soviet Union, to which the article avoids making direct reference, Hungarian newspapers were printed more beautifully and, more importantly, how freedom of the press was better serving the interest of the people and socialism without falling into the hands of the enemies of the people and freedom. His translation is smooth, unfolding with clarity when there are multiple modifiers. But what is more telling is probably the unhurried tone with which he writes. When I mentioned his translation from Russian to Mr. Sheng, he was very surprised because he had no idea his brother knew Russian, but he obviously did. Sheng Shuren’s own piece appeared in the September issue, and the title, when I first saw it, almost made me jump: The Headquarters of American Fabrications and Intelligence—the U.S. Information Agency. In the few hundred words that followed, he presented USIA from its budget, setup to its operations, using the same composed language and with the same clarity, except here and there, words like “flagrant”, “fabrication” would stick out like thorns from an otherwise smooth surface. Then, in the very last sentence, also the concluding paragraph, the tone rises sharply and the language turns into the kind of abusive language that I saw everyday in newspapers when I grew up and still is the standard language of China’s state media to threat, to vent and to express displeasure. “It is therefore clear that the USIA is a spy agency that robs over a hundred million dollars from the American people each year to engage in fabricating lies and collecting intelligence.” He might have written this himself, or the editor did. In any case, he had to learn to talk like this in the Xinhua News Agency. For a man with a liberal arts education like he had, it had to be a steep remaking of himself even just linguistically. If this article tells anything at all, it shows he still had a long way to go to adjust. In March 1958, Sheng Shuren and Uncle Erning, part of a large group of Xinhua personnel, were sent to Xushui, a county some 200 kilometers away from Beijing in Hebei Province, to help the Great Leap Forward campaign there. Xushui at the time was a national model of the Great Leap Forward promoted by the Central Committee of the Party, and universities and cultural institutions in Beijing, Xinhua included, had been sending their people to participate in this great leap forward to a communist society. In the previous winter, the impoverished county with a population of 300,000 had built more than two hundred reservoirs in response to the call for water management from the Center in Beijing, declaring that, for the first time in history, the county had once and for all eliminated both flood and draught. Literature about the Great Leap Forward in Xushui abounds, and from it I learned people in Xushui lived the life of the People’s Commune, eating together in the Communes’ canteens and marching with their hoes and baskets in military formation to the fields. They worked twenty-four hours a day in three shifts. The earth was dug as deep as three feet in order to use more fertilizer for higher yield; and grain was planted in improbable density to create agricultural miracles. I also learned that factories sprung up like bamboo shoots, and, overnight, each commune and each village claimed to have dozens of them. By the time the Steel and Iron Production Campaign peaked, “every household built a furnace and everyone was participating.” Xushui dared itself to open up universities, and lo and behold, it announced the establishment of 101 universities one day in July. Xushui also had a “Committee for the Movement of Writing” that covered the streets and walls with poems singing the praises of life in the People’s Communes and pictures in which farmers picked cotton on ladders, tall silos pierced through clouds, and pigs, as big as cows, were bursting their sties. The Great Leap Forward in 1958. If all this does not sound busy and tiring enough, study sessions and debates were held frequently. For study, there was the People’s Daily that sent the Center’s directives everyday. But what was to debate? People—whoever expressed any doubt about the Great Leap Forward and whoever was perceived as being halfhearted or lazy were the objects of the debate. According to documentation, the debatees were encircled, “shoved and pushed…until they were bruised and dizzy, kowtouing to admit they were wrong.” The debates were indeed effective, and, according to a piece in the People’s Daily on April 17, 1958, that promoted Xushui’s practices, “before the debates, 1,400 workers only dug 300 meters of irrigation channel in 14 days; after the debates, 1,000 workers dug 500 meters in 3 days.” In July that year, the Party mounted a nationwide campaign called “Bare Your Heart to the Party” and everyone in the Xinhua group was required to describe his or her thoughts and actions during the recent Anti-Rightist Campaign and the Rectification Campaign. 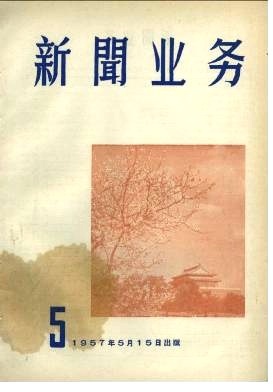 During the Purge of Anti-revolutionary Within Campaign in 1955, Uncle Erning, a young man in his twenties, had been reviewed for the uncompleted drafts of poems and stories that he had scribbled during the post-Korean war days when he was still stationed in North Korea as a war correspondent for the Xinhua News Agency, and conclusions had been made that “the ideas behind his works are reactionary and his own thoughts backward.” Now, asked to speak his mind to the Party, he hesitated. He was scared, “knowing that …the consequences will be serious.” Yet he didn’t want to hide it from the Party, “feeling that it would constitute unloyalty and dishonesty to the Party and therefore a crime.” So he bared himself: “I am still unable to accept the conclusions made about me by the Agency, but I am willing to be tested by the Party for as long as needed, reform myself and prove myself through my actions.” Days after that, Uncle Erning was arrested without warning during an often-held mass gathering of ten thousand people. He was dumbfounded, for he had no idea why they were arresting him (he had committed no crime) and how, in a matter of days, he had been incriminated a step higher to “a reactionary” and expelled from his job at Xinhua. Three hundred people were arrested on the same occasion, including Sheng Shuren. Now I know that, Xushui had newly built three labor camps that year and a local leader had ordered, “Each camp needs 1,000 workers, hurry up to arrest people and send them to the camps.” Within a few months, more than four thousand people had been arrested in the same manner in Xushui. Uncle Erning and Sheng Shuren were sent to the August First Camp to receive their “education through hard labor.” Behind the barbed wire enclosing the Camp, they were organized, just as people outside, to create “Satellite Fields”—fields that would have such unheard-of high yield that it would be like launching a satellite. 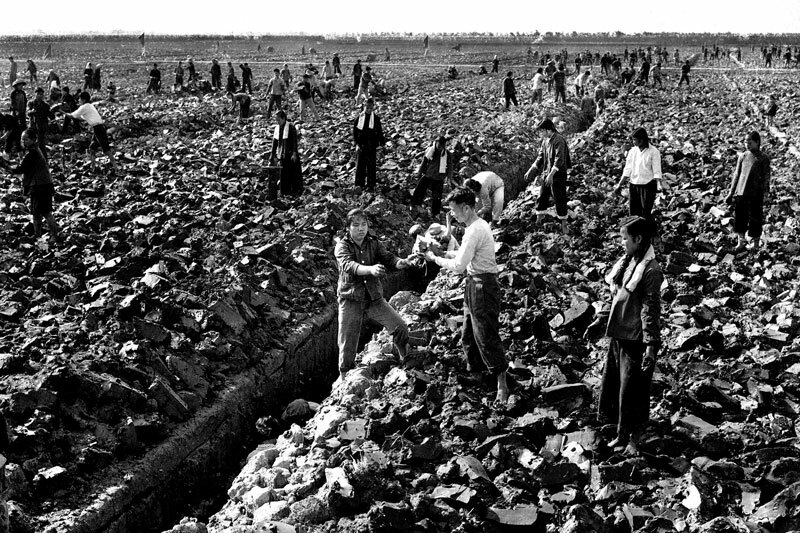 They dug, composted, moved rocks, and made cotton-padded shoes in the winter for perhaps the army. Outside the barbed wire, Xushui was becoming the center of attention in all China. Waves of visitors, from leaders of the country to the leaders of the provinces to the generals of the Republic, from the Congress of People’s Representatives to members of the People’s Consultation Committee, from scientist to literary figures, from foreign diplomats to friendly foreign news reporters, swarmed the place to witness the spectacular new look of a communist county. The People’s Daily touted that “the People’s Communes in Xushui will bring their members, in the near future, to the most wonderful arcadia in human history, that is, the free kingdom where ‘everyone does his best and takes whatever he needs.’” The frenzy peaked in August 4, 1958, when Mao Zedong visited a village in Xushui, only a few miles from the Camp where Sheng Shuren and Uncle Erning were confined. Local officials answered the Great Leader’s questions and briefed him about their goals: 10,000 kilos of millet and 500,000 kilos of potato per mu (about 0.16 acre), so on and so forth. “How are you going to eat that much food? What are you going to do with it?” Mao asked. When the officials conceded that they had not thought about that, Mao laughed and continued, “It’s certainly good to have a lot of food. The state doesn’t want it, others don’t need it, and the farmers can eat five meals a day!” We all know what followed was not the question of eating three meals or five meals a day, but a famine that lasted for a few years, resulted in the death of millions, and was labeled “the three-year natural disaster” by the official history book. 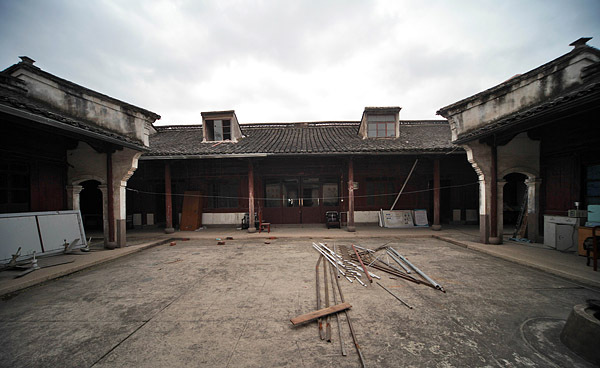 In Xushui, the famine started as early as in 1959, people left en mass to search for food, and the government set up barriers and checkpoints on roads to stop them from leaving. At the end of 1960, the August First Camp was disbanded, and Uncle Erning and Sheng Shuren, greenish and edematous, were dismissed and told to go back to their respective hometown. I must add now that, while Uncle Erning was in the camp, in Beijing, meetings were held to criticize and “educate” his young wife, my aunt, who was given the choice of being associated with a reactionary or “drawing a line” between him and her. She had been expelled from the Youth League for dragging her feet. Finally she wrote a letter to Erning in the Camp, telling him she had signed the divorce certificate which was brought to her by two men, all filled out and dated already, bearing the name and the seal of the People’s Court. The couple then had only been married for eleven months. February 3rd marks the beginning of the Year of the Rabbit, and for many of you that might be the extent of your knowledge of Chinese New Year (or as we call it in China, Spring Festival). So today we’ll look at how Spring Festival is celebrated. For most Chinese, it means returning to their hometown. Almost half of China’s population no longer lives in the same town as they were born, which leads to the largest annual human migration. The whole country is moving the few weeks before and after the holiday. The typical family will celebrate by coming together for the biggest meal they can afford, and will watch the special Spring Festival tv program, or play mahjong; many will light off a few fireworks. Within a family all of the children will receive 红包 (hongbao), which are red envelopes with some money inside. Let’s look at each of those parts a little closer. Heading home means bringing back their earnings from the year, and showering their family with gifts. Many of my friends complain about how expensive Spring Festival is, it’s kind of like Christmas if you had to give gifts to your parents and children, but didn’t receive anything yourself. The pressure is so great that theft always peaks just before Spring Festival. The huge meal is probably the most important part of Spring Festival. Each food has a special meaning. For example: Fish (鱼,Yu) sounds like abundance (余, yu). So the expression “Every year is abundant” also sounds like “Have fish every year”. The meal will have as many dishes as the family can afford, and pretty much every dish has a double meaning (Wikipedia has a good list of these). This part is usually compared to Thanksgiving. At midnight, every day for 2 weeks, fireworks light up the sky. On my first Spring Festival in Beijing we had been told that fireworks were banned in the city center. Apparently nobody else was told, the fireworks lasted for hours. It was one of the most amazing things I have ever witnessed. Hongbao is what children’s minds leap to when they hear “Spring Festival.” Hongbaos are given to them by all of their elder relatives, often adding up to more than a hundred dollars, which is a massive haul for a Chinese child. Toy sales explode like Black Friday. When I was learning Chinese, we were taught a phrase 热闹 (renao), which literally means hot and noisy. The usage though means something like a crazy, wild celebration. The professor said that until we spent Spring Festival in China, we couldn’t fully understand the meaning. They were right.